Now that everybody has posted there favorite new features in Veeam v9, I want to take the time to highlight one particular feature. This is the credential manger part in Surebackup. This extra tab can be found when you configure your VM in the application group. So why this extra tab? Well you can read my Surebackup Sharepoint validation script and instantly see the biggest problem. Storing your credentials in a secure way is 60% of the whole blog article. This is because of in v8, all scripts are started by the backup service and thus inherent this account and permissions. Enter v9, the credentials tab is added. My first assumption was that all scripts will run under the configured account. That turned out to be incorrect. The script will be started up with the backup service account, but the Network Credentials are changed. This has one big advantage, even if your backup server is not in the domain, you can still use these credentials. Think of it as using "runas /netonly" to start up an application (this is how Product Management explained it to me). 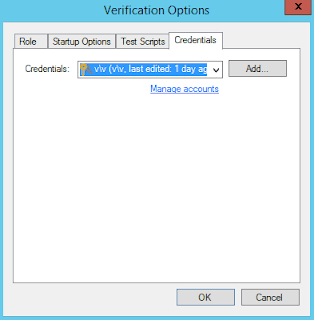 The credentials are only applied when connecting to a remote server. So for the fun of it, I have already looked into some example scripts. They might not be all that stable and it is better to change them to your liking, but they should give you an idea on where to start. If you then setup the account correctly that can access the webservice, it will authenticate succesfully with the network credentials, download the file and match the content. The real magic? "$web.UseDefaultCredentials = $true"
It will logon to the instance, issue a "use" and "query the tables" to all databases. Finally it check the state of the databases in "sys.databases". The use, makes sure that SQL Server actually tries to mount the database. But the cool thing is, you can easily alter the example to execute a full blown sql query and then check if the output satisfies your need. The real magic? "Server=$instancefull;Integrated Security=True;"
Also added a template for just any plain Powershell script . This might look trivial (it doesn't do anything but logon and write the hostname), but I spend some time figuring out you need " -Authentication Negotiate" and that there is no need to setup SSL. However, do check if the firewall allows remote connection from outside the domain if you want to use this one. So no more excuses for writing those extensive application test scripts!